The attorney general says a North Carolina company has breached agreements to protect the Kennebec Arsenal, a National Historic Landmark. AUGUSTA — A North Carolina company that agreed to preserve a historic arsenal in Augusta has failed to do so and could be sued if it doesn’t take steps by Oct. 1 to prevent further damage, the Maine Attorney General’s Office said. 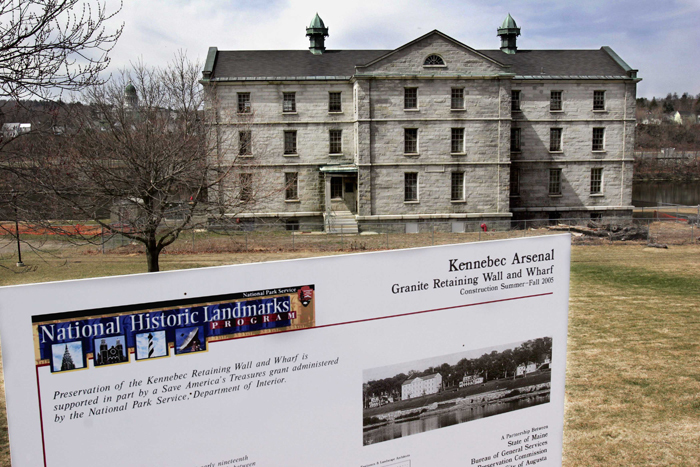 In a letter dated Wednesday, the office told a company official that the firm has breached agreements to protect the Kennebec Arsenal from vandals, thieves and weather. The arsenal is a National Historic Landmark. The property, located in downtown Augusta across the Kennebec River from the State House, is considered the best surviving example of a 19th-century military complex of its kind. Its eight granite structures, dating to 1828, were supposed to be renovated for residential and commercial use after the property was conveyed from the state to Main Street I LLC in 2007. But since then, windows have been smashed and buildings have been broken into and marked with graffiti. Thieves have ripped out copper piping and iron balusters and railings, doors have been broken and fires have been started. The letter’s recipient, Main Street President Thomas Niemann, did not answer the state’s assertions directly. But he said Thursday that the company bought the property for $280,000 with future payment of $450,000 due when building permits are issued for new construction there. Niemann told the Kennebec Journal in the spring that his Durham, N.C.-based firm is dedicated to its plan for restoring and renovating the complex, but plans have been hampered by the struggling economy. The attorney general’s letter to Niemann says the state would be open to a “mutually acceptable resolution” in which the 41-acre property would be conveyed back to the state and Main Street would compensate the state for damage to the property. When the state sold the property, plans for its redevelopment weren’t complete. But developers envisioned housing, a restaurant, upscale shops, offices and conference space on the site, which slopes toward the river and is within sight of the State House. The arsenal first rose amid a border dispute with Britain in northern Maine in the early 19th century. The dispute lasted until 1842 and for a while threatened to turn into war. The arsenal remained garrisoned and was turned over to the state in 1905. For years, some of the arsenal buildings housed state mental patients.